Shikhar Dhawan struck a sublime hundred in the nick of time as India delivered yet again in a series decider to beat Sri Lanka by eight wickets in the third ODI and record their eighth successive win in a bilateral contest. India raced to the 216-run target in 32.1 overs with Dhawan (100 n.o. off 85) completing his 12th ODI ton in what turned out to be the penultimate over of the match. Shreyas Iyer made a significant 65 off 63 balls, his second successive half century, but missed on the opportunity of scoring a hundred in a winning cause. Dinesh Karthik remained unbeaten on 26 alongside Dhawan and hit the winning runs. m getting all out for 215 from a promising 160 for two. The visitors failed to apply themselves on a pitch that offered decent turn as Indian spinners Yuzvendra Chahal and Kuldeep Yadav picked up three wickets apiece. 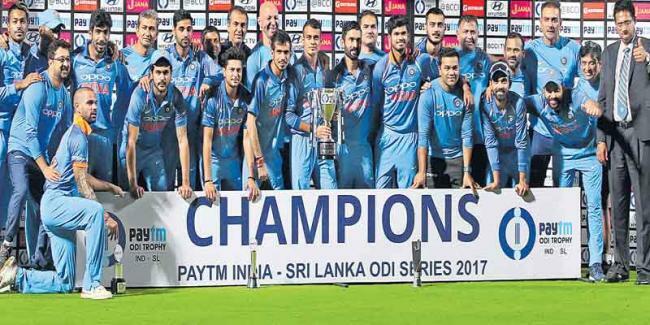 With the professional performance tonight, India won their sixth ODI series of the year and eighth in a row since July 2016. Sri Lanka, on the other hand, were consigned to yet another defeat in a rather miserable year in which they have won only five matches.